Meet visual artists, writers, and dancers at this free multi-disciplinary arts event. 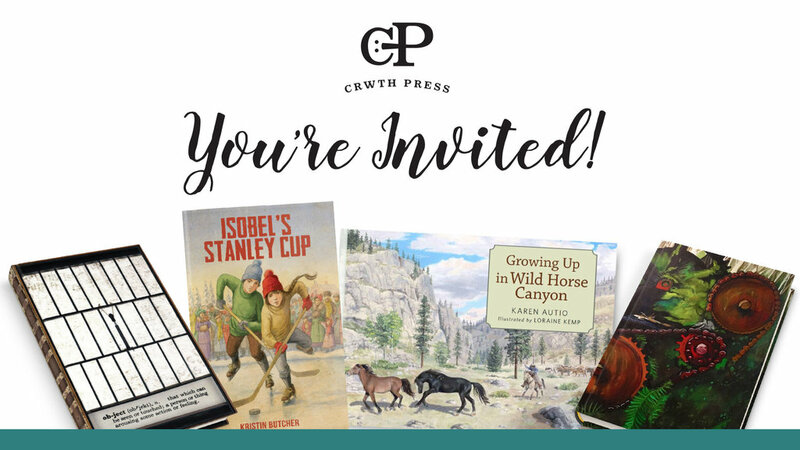 Crwth Press is celebrating the launch of four books, two journals and two children’s books. Visual artists dea Kearns of Victoria and Sean Nattrass of Gabriola Island will be launching journals that feature their art on the cover. Campbell River writer Kristin Butcher will launch her novel for children, Isobel’s Stanley Cup, and Karen Autio and Loraine Kemp of Kelowna will be celebrating their upcoming book, Growing Up in Wild Horse Canyon. Sacred Centre Dance will be performing 5 numbers form their upcoming feature presentation, Water. The event includes door prizes, snacks and a cash bar.